Strawberry crown borer, about 14 mm long. In observance of National Moth Week, I thought I'd mention a few of our unusual local mothy residents. 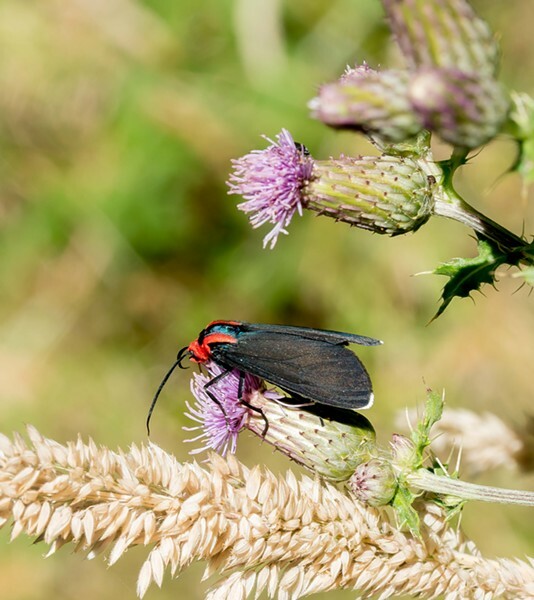 Together with butterflies, moths comprise the order “Lepidoptera,” roughly translating to scale wing. A good rule of thumb to distinguish between the two is that butterflies have thin antennae terminating in a club shape, while moths (with a few notable exceptions) have different types of antennae. 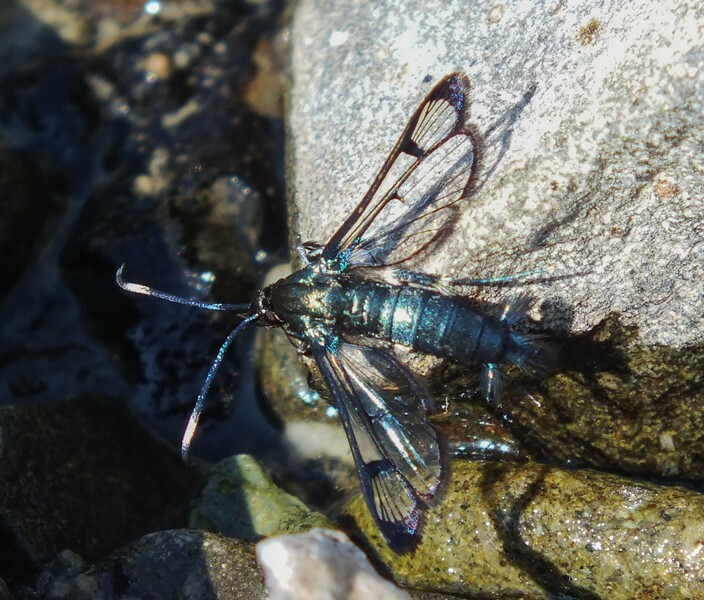 I had to go online to learn how to pronounce the family of Ctenucha multifaria, also known as the California Ctenuchid. This is a striking medium sized day flier often seen, but seldom in abundance. Black wings and an iridescent blue-greenA body are set off by crimson epaulettes, and tiny white accents at the front wing margins. (Sounds like someone announcing a runway fashion model. )The books say the larvae feed on grasses but, this year, I've seen them on a vast array of plants, including the fir tree in my front yard. The Strawberry-borer (Synanthedon rutilans) is an unwelcome visitor in my garden. Although, like all moths, the adults feed on nectar, this one's larvae feed on, you guessed it ... Strawberry and other berry plants, damaging their root crowns. Having the size, shape and general appearance of a yellow jacket, this is yet another example of aposematic coloration and Batesian Mimicry. To the best of my knowledge this moth is harmless, but benefits from the bad-boy looks. 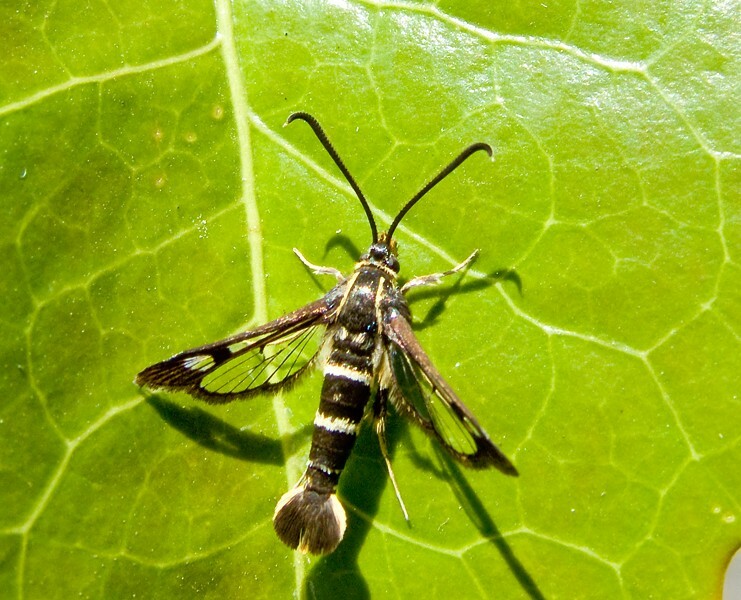 Western Willow Shoot Borer (Synanthedon albicornis), is another clearwing moth whose young are known to feed on willow shoots. Perhaps the white markings on its antennae and overall dark coloration resemble the local tough guy, the Bald Faced hornet, to some potential predators. When I took this photo, it was the one and only time I've ever seen one of these. California Ctenuchid, about 20 mm long. Western Willow Shoot Borer, about 16 mm long.